In 2003, TPL assisted the Appalachian Mountain Club (AMC) in purchasing the Katahdin IronWorks property as the first project in AMC's MaineWoods Initiative. 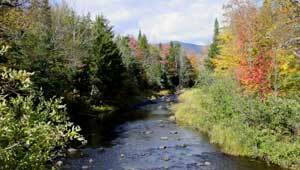 The initiative was created to integrate habitat protection, recreation, education, and economic development based on sustainable forestry and recreation-based tourism in the heart of the 100-Mile Wilderness region, which stretches from Monson north to Mount Katahdin along the Appalachian Trail. TPL worked with the AMC, the state, and the Maine Congressional delegation to seek public and private funding to secure permanent protection of the tract's critical natural and economic resources through a conservation easement to be acquired by the State. The property is at the heart of one of the most scenic regions of the state and is known as much for its lakes and ponds as its rugged and dramatic mountains. As part of their management plan, AMC will build over 50 miles of new hiking and skiing trails, traditional backcountry sporting camps, tent sites, remote cabins and canoe landings for the public to enjoy. Simultaneously, the project aims to strengthen the economies of communities in the region through the sustainable harvest of the property's timber resources and by the sensible management of the property's wide variety of recreational opportunities to attract additional nature and recreation-based tourism.